For the second year in a row, Milgard® Windows & Doors was named the highest online rated window and patio door brand, as determined by MetrixLab’s Net Reputation scoring system. “Milgard held the number one position through all of 2017 and even managed to strengthen their position by the end of the year,” said Ryan Murphy, Senior Research Manager at MetrixLab. In order to measure the sentiment of how customers feel about a brand online, a Net Reputation Score (NRS) can be used. The score is derived by looking at real customer experiences, shared online, that mention a company’s brand name. Millions of websites and social media comments are reviewed to derive the score which is measured on a 200 point scale. Positive and negative emotional sentiment and the reputation of the website also factor into the calculation. With almost 30,000 reviews on milgard.com, it’s easy for homeowners to share their stories. They can choose to comment on the experience they had with a Certified Milgard Dealer on the sale and installation process, talk about how new Milgard windows and patio doors are quiet and energy efficient in their home or share feedback about the Milgard service team. You can also find Milgard customer reviews on popular home renovation sites, such as Houzz, where Milgard has won the Best of Houzz Design award, four years in a row. Milgard Windows & Doors, a Masco company based in Tacoma, Washington, offers a full line of vinyl, wood, fiberglass and aluminum windows and patio doors for builders, dealers and homeowners, backed by a Full Lifetime Warranty, including parts and labor. The company has been recognized as Builders Choice for vinyl and fiberglass windows in the Western United States, in a yearly survey sponsored by Hanley-Wood Inc., publishers of BUILDER Magazine. 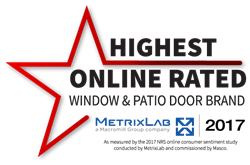 Milgard® is the highest online rated window and patio door brand, as measured by the 2017 NRS consumer sentiment study conducted by MetrixLab and commissioned by Masco. Milgard has approximately 3,800 dealer locations nationwide. For more information, visit milgard.com or call 1.800.MILGARD. Masco Corporation (NYSE: MAS), parent company of Milgard Windows & Doors, is a global leader in the design, manufacture and distribution of branded home improvement and building products. Our portfolio of industry-leading brands includes Behr® paint; Delta® and Hansgrohe® faucets, bath and shower fixtures; KraftMaid® and Merillat® cabinets; Milgard® windows and doors; and Hot Spring® spas. We leverage our powerful brands across product categories, sales channels and geographies to create value for our customers and shareholders. For more information about Masco Corporation, visit Masco.com.